There is a lot of hype with this bag as you guys probably know. Here is a little review to help you decide if this is the bag for you, if you’re indecisive or you want to see the features. The bag isn’t made of leather. 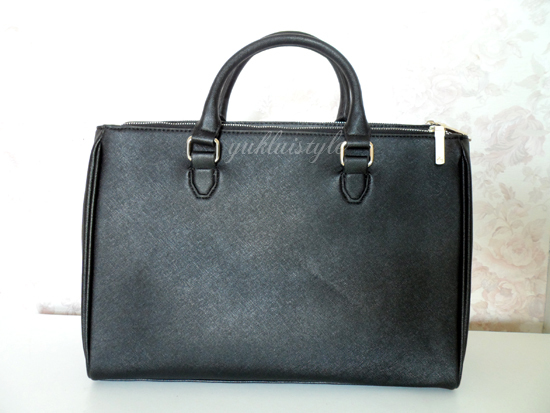 It’s made of polyurethane.There are 5 compartments, 3 zipped and 2 with a magnetic clasps. The bag is lined with a gorgeous wine red shade. 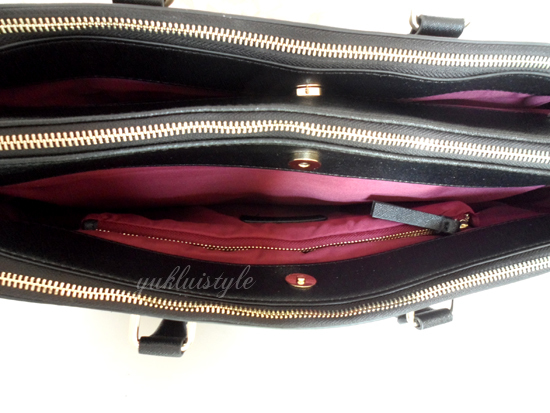 The middle zip compartment is for your laptop. It’ll fit my 13 inch macbook easily. I would say you can fit up to 15 inches with ease. The best thing is that it is padded in both directions. In this comparment, you have card holders, mobile phone holder and coins purse. I must say, the card holder is very useful. I can just put my train tickets and railcards there without having to reach for my purse all the time. 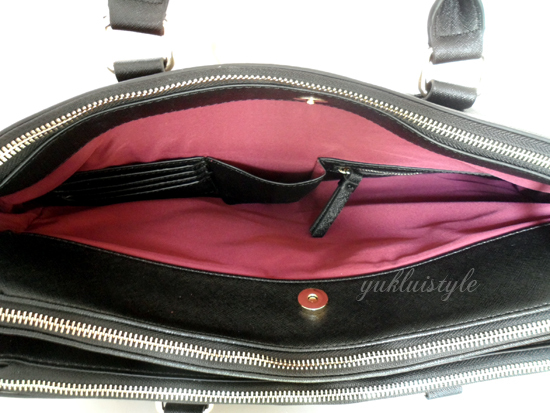 In this other inner compartment, there’s a pocket where you can place your iPad or other tablet devices. It is also padded for the extra security. You can also put things in this compartment. There is also an adjustable attachable shoulder strap. There isn’t much padding but the extra layer does help relieve your shoulder from the weight a little bit. Bag does become heavy when you have a laptop and documents in it. The hardware is gold and it looks best on black. Wish I bought this ages ago whilst at university. It would help me so much especially during my dissertation and exam period. It would help me be more organised. A sturdy, structured, very practical bag that can fit a heck of a lot of junk, I mean useful items. A chic looking bag and can suit every outfit choice. 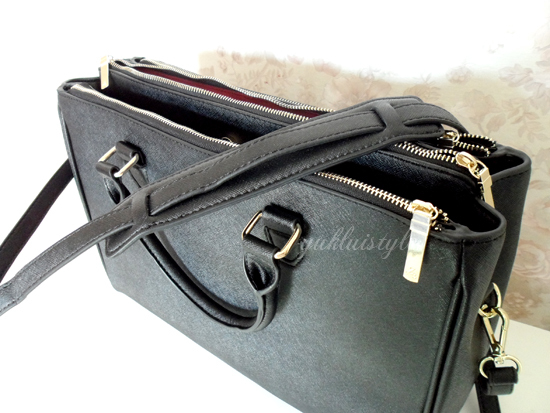 It is a big bag, measuring 30 x 42 x 15cm, it may look a bit big on petite ladies. I didn’t find the bag as heavy when it’s empty but some may find it heavy, some may not. For £49.99, it’s worth it as this is my work bag since I commute to and from. This is a dupe for the Prada and Chanel bags. Now I don’t have to carry my handbag and a laptop bag around anymore. I did find that there was a little trouble with the zips. Sometimes, it’s not smooth when opening and closing but to be honest, the positives overcome this one negative. This bag had made my life easier. If oversized bags aren’t your thing, then this won’t be. It is available in black. I have seen it available in brown however I’m unsure if they’re still selling it in brown. You can purchase it instore or online. Do you have one? What do you think of this bag? Love the bag! I saw it in stores and was so tempted to buy it. haha. That bag is so fabulous! Hi. I was wondering if you think this bag would work for a high school situation. 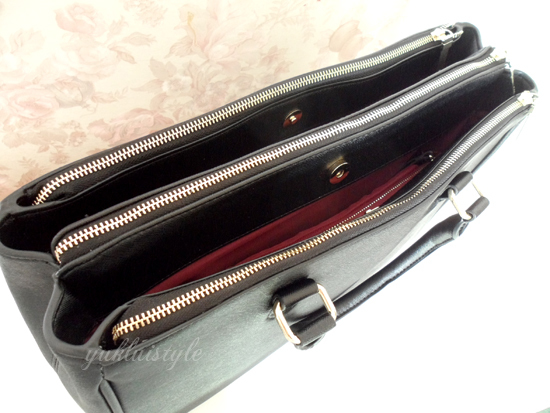 I was thinking 4 folders in one of the outer zippered section and one binder(1 inch) in the claspy part. The rest of the bag would just be the other things I need throughout the day. Do you think the bag could work?